Rama, the protagonist of the ancient Indian epic Ramayana and the beloved son of King Dasharatha of Ayodhya, was about to be formally declared as the crown prince when destiny intervened and he was forced to spend fourteen years in exile or forced Vanavas. Rama was loved not only by his parents Dasharatha and Kaushalya, but also by his two step mothers Kaikeyi and Sumitra. He was the eldest of the four sons of Dasharatha, the other three being Lakshmana and Shatrughana (sons of Sumitra), and Bharata (son of Kaikeyi). His younger brothers loved and revered him and the people of Ayodhya doted on him and were happy to have him as the king in waiting. But that was not to be. Kaikeyi, Rama's step mother was initially as happy as the rest of the royal household at the prospect of Rama being made the crown prince. However, her mind was poisoned by Manthara, a scheming hunch-backed maid, who convinced her that her fortunes will go down the hill and Bharata will be exiled or killed once Rama became the king. Having convinced Kaikeyi, Manthara reminded her of the two boons that Dasharatha had given her long back for saving his life and asked her to use them to force her husband to send Rama to the forest for fourteen years and declare Bharata as the crown prince of Ayodhya. When a now brainwashed Kaikeyi asked Dasharatha for her two boons and told him what her demands were, Dasharatha pleaded with her to ask for anything else she wanted, but not be as cruel on his son Rama as to send him to the forests for such a long time. But Kaikeyi was adamant and reiterated her demands upon which Dasharatha became ill and fainted. When he came to, he reluctantly sent for Rama and told him about the two boons Kaikeyi had asked for. Rama graciously accepted them and asked his father, with his characteristic calmness, not to worry so much about so little a problem. And thus Kaikeyi was one of the central female antagonists of the epic Ramayana who was responsible for laying the ground for the future turn of events. Though she later regretted her stubbornness and greed, the chain of events was now irreversible. Rama bid farewell to his parents and step mothers, his brother Lakshmana, and his wife Sita. However, both Lakshmana who was a devoted younger brother and Sita, Rama's faithful consort, were determined to accompany him to the forest and finally Rama had to give in and agree to take them along. Bharata, along with Shatrughana, was at the time visiting his maternal grandfather, the king of Kaikeya and was not informed of the developments. As was the custom, all three of them changed into hermits' clothing made of plain saffron colored cloth and left the palace in a chariot driven by Sumantra, Dasharatha's chief counselor. The people of the kingdom were shocked and saddened seeing their favorite prince going to the forest and followed them as far as the bank of the river Tamasa. After spending the night there, Rama and his companions got up at dawn and left the place leaving the as yet fast asleep citizens behind. Sumantra drove the chariot through the day till they reached the river Ganges where they all decided to halt for the night. This is where they met Guha, the hunter chieftain, who requested Rama, Lakshmana and Sita to stay as his guests for the Vanavas period and enjoy the riches of his kingdom. 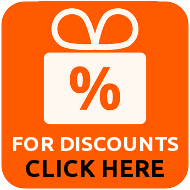 However, Rama was committed to his promise to Dasharatha that he would spend the next fourteen years in forests and live a hermit's life and as such, he politely declined the invitation and thanked Guha profusely for his friendship and for being so generous. The next morning, after extracting a promise from Sumantra that he would look after Dasharatha, Rama and his companions took leave of both him and Guha. 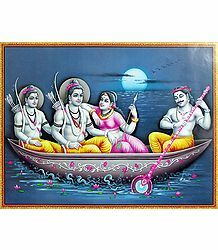 Rama, Lakshmana, and Sita now needed to cross the river Ganges for continuing their journey and so, they approached a kewat (Boatman) to ferry them across the river. The kewat promptly replied that he would ferry them only if Rama allowed him to wash his feet with water as his feet had magic dust that converted anything they touched to a woman (in reference to the Ahilya episode). Rama understood his intentions, and smilingly agreed. Kewat washed Rama's feet with extreme devotion and then invited them on the boat. When they reached the opposite bank, Sita tried to pay Kewat with her ring, as they had no money but kewat refused to accept fare and said that people belonging to the same profession do not charge each other. When Rama did not understand the meaning of his words, kewat explained that while he ferried people from one bank of the river to the other, Rama, the avatar of Lord Vishnu, ferried people from one side of the ocean which is this world to the other side called moksha or liberation from the cycle of birth or death. He requested Rama to ferry him across this world when his time came instead of paying him now. Rama was very pleased with kewat and blessed him. Sumantra returned to Ayodhya with a heavy heart only to find Dasharatha on his death bed. Seeing Sumantra alone, Dasharatha finally accepted the truth that his beloved son was not going to be around for a long time and the realization broke his heart and he died the same night. Bharata, oblivious of all that had transpired in his absence from Ayodhya, was sent for with the message that his presence was immediately required in the city. On reaching the city, he was shocked to see it silent and lifeless. When he entered the king's palace, he found it empty and rushed to his mother to find out what tragedy had befallen the place. Kaikeyi informed Bharata of his father's demise. Bharata was inconsolable and wanted to know the reason behind his sudden ill health and death. A visibly pale and shaken Kaikeyi related the events of the past few days to him, and asked for his forgiveness as she had done the scheming for his benefit. But Bharata, who loved and respected his elder brother, was outraged and then ashamed that all this had happened because of him. He blamed himself and his mother for his father's death and brother's misfortune and refused to forgive his mother. He berated her and refused to have anything more to do with her and went straight to meet his step mother Kaushalya. Kaushalya and Sumitra were faint from all the crying but welcomed Bharata and requested him to take both of them to Rama in the forest and wished him good luck as the future king. Bharata, ashamed of his mother's deeds, apologized to both of them on her behalf and asked them not to forget that he loved Rama as much as they did and would never dream of ruling the kingdom while Rama was living the difficult life of a hermit in the forest. He promised to bring Rama back to Ayodhya and left for the forest soon after. After completing the last rites for his father Dasharatha, Bharata, along with Dasharatha's queens, left Ayodhya with his army in search of Rama. After travelling for many days, they reached the forests of Chitrakoot, a beautiful and holy place where Rama was living with Sita and Lakshmana on the advice of sages Bhargava and Valmiki. On seeing Rama, Bharata could contain himself no longer and fell to his feet tearfully. Rama embraced him and consoled him and asked him why he had come to the forest leaving their father alone? A sobbing Bharata gave the tragic news to his brothers that their father was no more and had died calling out to Rama. Rama, who loved his father very much, was shocked to hear this and fainted. When he gained consciousness, all of them went to the banks of the river Mandakini to offer prayers to their departed father. Bharata requested his brother many times to return to Ayodhya with him and take his rightful place at the throne, but Rama asked him to rule the kingdom as he had promised his father to spend fourteen years in the forest and he did not want to disobey him. On hearing this, Bharata humbly requested Rama to give him his sandals so he could place them on the throne and run the kingdom in Rama's name as his deputy. Rama gracefully agreed to it and Bharata went back to Ayodhya after taking his brother's blessings. The beautiful Chitrakoot no longer held any significance for Rama, now that he had met Bharata and heard the news of Dasharatha's demise. The trio spent the next few years wandering through the great forest without settling down anywhere permanently. They visited a number of sages and other holy men during this time and sage Agastya advised Rama to set up home at Panchavati, on the banks of the river Godavari. On reaching Panchavati, all of them were taken with the beauty and serenity of the place and Lakshmana erected a small, yet elegant hut where they all lived peacefully. 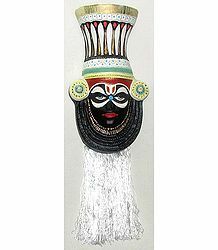 One day Surpanakha, sister of the Rakshasa King Ravana of Lanka was passing by and saw the handsome prince Rama. She fell in love with him and transforming herself into a beautiful woman through her magical powers, she proposed marriage to him. 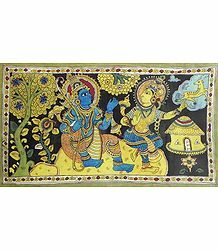 Rama, in jest, pointer her in the direction of Lakshmana who was equally good looking and asked her to marry him instead as he himself was already married to Sita and she had accompanied him to the forest. Surpanakha now approached Lakshmana and proposed to him who had understood Rama's intention and told Surpanakha that he did not wish to marry her either. Thus humiliated, she again went back to Rama, and this time attacked Sita as she was the reason behind Rama's refusal of her proposal. Seeing this, Lakshmana jumped in between and cut off her nose. A bleeding Surpanakha ran away swearing revenge. Later, she sent her brothers, demons Khara and Dooshana, along with an army of fourteen thousand demons to kill Rama. However, the brave Rama asked Lakshmana to protect Sita and killed the brothers and their huge army single handedly with his bow and arrows. An agitated Surpanakha now went to her brother Ravana and told her how Lakshmana had cut off her nose while she was trying to bring the beautiful Sita to marry Ravana and how Rama had killed Khara and Dooshana and the demon army. The incident enraged Ravana so much that he vowed to take revenge and hatched a plan to abduct Sita. Surpanakha played a pivotal role in the epic by causing the abduction of Sita by Ravana, which ultimately led to the great war in Lanka and the death of the demon king. Ravana sought the help of his uncle Maricha, a demon who had been defeated twice earlier by Rama, in his plan for kidnapping Sita from Panchvati. Initially, Maricha refused as he was sure it meant certain death, but when Ravana threatened to kill him then and there, he agreed thinking it was better to die at the hands of Rama than Ravana. As per their plan, Maricha turned himself into a golden deer and started running around Rama's hut. When Sita saw the beautiful deer, she was enchanted by it and asked Rama to get the deer for her to keep as a pet. While Rama agreed to go after it on Sita's pleading, Lakshmana was convinced it was a ruse by demons and tried to stop Rama from following the deer. However, Rama said that while this was probably the case, if the deer turned out to be a demon, he would kill him and just asked Lakshmana to protect Sita at any cost while he was away. 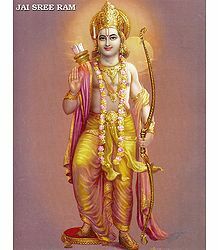 The deer led Rama into deep forest, and unable to capture it, Rama shot an arrow to kill him. Seeing the end near, Maricha returns to his original form and calls out to Lakshmana and Sita for help in Rama's voice. While Rama, understanding the ploy, started walking back towards his hut, Sita requested Lakshmana to go and help Rama. Lakshmana tried to calm Sita down by telling her that Rama was invincible, Sita was not convinced and on the verge of hysteria. Seeing this, Lakshmana drew a line around the cottage chanting mantras and asked Sita to promise him to stay within that Lakshmana Rekha. He told her that as long as she stayed within it, nobody will be able to harm her or come near her crossing the rekha. Thus stipulating, Lakshmana went looking for Rama, still with misgivings about leaving her alone and disobeying his brother. Ravana, who was waiting exactly for this moment, turned himself into an ascetic and came asking for Sita's hospitality. Initially, Sita was reluctant to offer him food, but when Ravana berated her for not showing respect to an ascetic, she was forced to step out of the protective Lakshmana Rekha to offer him food. 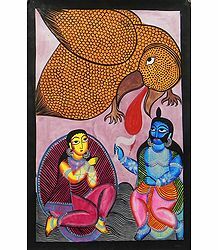 The moment she did that, Ravana came back to his original form and forcibly carried her over to his divine aircraft, the Pushpakvimana, and flew towards Lanka. On Ravana's way back to Lanka, the vulture king Jatayu tried to rescue Sita and fought valiantly with him but Ravana soon overpowered him and cut his wings making him fall down. In Lanka, Ravana proposed marriage to Sita but she being eternally faithful and devoted to Rama, refused. When everything from request to intimidation failed, Ravana gave Sita one year to think about his proposal at the end of which he would kill her if she still refused to marry him. In the mean time he kept her captive in his garden Ashoka Vatika surrounded by female demon guards. While Ravana was a demon, he was also a learned man and a devotee of Lord Shiva. He needs to be given credit for not forcing his will on Sita, and instead allowing Sita a whole year in which to change his mind and accept him willingly. Of course, his misdeeds of abducting a woman and offering marriage to a married woman were later responsible for his death at the hands of Rama. As soon as Rama met Lakshmana, he asked him why he had left Sita unprotected. Lakshmana narrated the incident to him but Rama was apprehensive. They soon reached their home only to see no sign of Sita anywhere. An inconsolable Rama ran around looking for Sita everywhere and called out to every tree, bird and beast asking for Sita's whereabouts. When he was too exhausted to walk further; he sat on a rock and told Lakshmana that he would die in the forest where his beloved Sita had died. Lakshmana tried to console him and soon they resumed their search finally meeting Jatayu who informed him that Sita was abducted by the rakshasa king Ravana and taken to Lanka. Thus saying; Jatayu apologized for not being able to do more to save Sita and passed away. The two brothers had no idea now how to look for Ravana and they continued their wandering in the forest. All of a sudden, they heard a terrible noise and saw a huge head less and legless monster coming towards them. He just had a big hair-covered trunk with one eye in the middle of his chest and an ugly mouth beneath it. With his two long arms, he tried to grab the two princes but they were alert and promptly cut off her hands. The injured monster cried in pain and asked them who they were in a human voice. A surprised Lakshmana introduced himself and Rama and told him that they were searching for Sita. The monster replied that his name was Kabandha and he was cursed to become a monster and requested them to burn his body to ashes once he died to release him from the curse. Saying this, he fainted and died and Rama and Lakshmana did as requested by him. 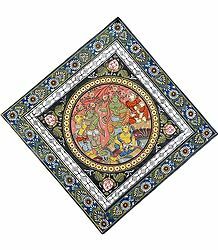 From his ashes rose a celestial being that bowed and thanked the two brothers and told them to go west and make friends with Sugriva, living at Rishyamukha Mountains, and seek his help in rescuing Sita. He also suggested that they meet Shabari, an old devotee of Rama, in her hermitage. Shabari's hermitage was located on the banks of Lake Pampa. Shabari had served the sage Matanga for a long time and when left for his heavenly abode, he asked Shabari to stay at his hermitage and wait for Rama's visit which would open the doorway of heaven for her. A devoted Shabari waited all alone for two years. When Rama and Lakshmana finally arrived at the hermitage, she was ecstatic and washed their feet. She offered them the berries she had collected the other day as she had nothing else to offer, but in her zeal, she tasted each berry herself first to make sure they were sweet. When she realized that she was offering Rama half eaten fruit, she was ashamed, but Rama ate them and told her that it was her love and devotion that mattered and not her situation in the world or what she offered. Shabari then sought permission from Rama to depart the world and passed away in a dazzling brightness. Ramayana, or the story of Rama, depicts its protagonist as an obedient son, a faithful husband, and a loving brother. 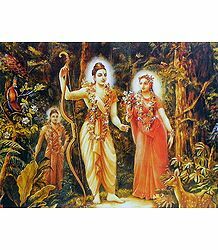 Rama agreed to spend his youth wandering in forests to honor his father's words, his love for his brothers inspired unquestioning devotion in them and his love for his wife Sita made him cry in anguish at her abduction and wish for death. Rama, from an early age, believed in living life according to Dharma. No adversity could shake his resolve in the laws of Dharma and many a times, he had to give in to the demands of his loved ones because of it. Rama would never have agreed to take Sita to the forest had she not reminded him of a wife's duty to be with her husband at all times, good and bad. This is the reason why Rama is considered a hero worthy of being worshipped by one and all.